When you pray, be careful what you pray—I’m serious, be very careful. Some translations use the word “sins” or “transgressions” in place of debts, but the intent is the same. That is, if we forgive fully, we are asking God to forgive us fully. 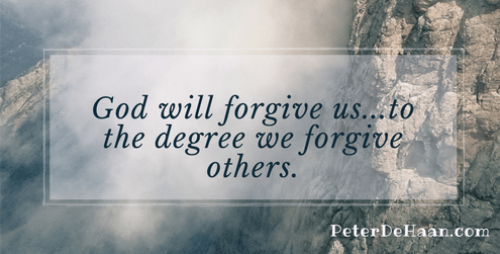 However , if we only forgive partially—keeping grudges, holding onto ill-feelings, or harboring hate—then we are asking God to only forgive us partially. Our lack of forgiveness towards others could limit the amount of forgiveness we receive. Ouch! So when I pray that prayer, I do so carefully and with some trepidation; some days, I even want to skip that part! However, skipping it is not the answer. A better solution is to be steadfast and diligent in forgiving others—then we can likewise expect the same from God.